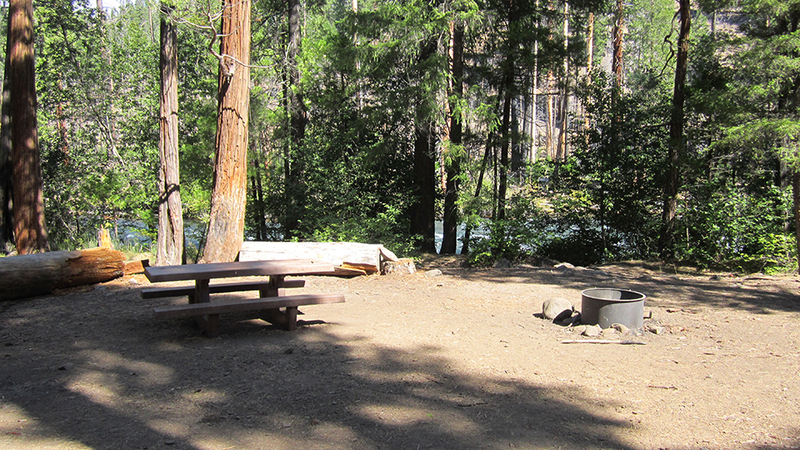 Monty Campground is located about 38 miles northeast of Sisters in a very peaceful, picturesque setting on the lower Metolius River just above Lake Billy Chinook. Created by Round Butte Dam, Lake Billy Chinook fills the canyons of the Crooked, Metolius, and Deschutes Rivers and the lake’s three large arms offer 72 miles of shoreline; rugged hills and a diverse conifer forest surround the lake. Campers at Monty Campground will have easy access to many hiking trails and may want to explore the Tam-a-lau Trail, a scenic hike that starts on a peninsula at the confluence of the Crooked River and the Deschutes River in Cove Palisades State Park. The cold, clear waters of the Metolius make it highly fishable, and lucky anglers will find rainbow trout, bull trout, kokanee salmon, and mountain whitefish. Please know that no live bait is allowed; lures and flies only. Monty Campground is made up of 34 camping sites; all are first come, first served and RVs are not recommended. There is no water service at Monty Campground, but site-wide amenities include a firewood vendor, vault toilets, and a fire ring and picnic table at each site. The per night, per site fee is $14 for the first vehicle and $7 for each additional vehicle. Monty Campground is generally open early June through early September; check website for current information.